First transmitted in 1960, David Attenborough encounters a peculiar cult group while visiting the New Hebrides as part of his expedition to the South West Pacific. First transmitted in 1960, David Attenborough encounters a peculiar cult group, while surveying the New Hebrides as part of his expedition to the South West Pacific. 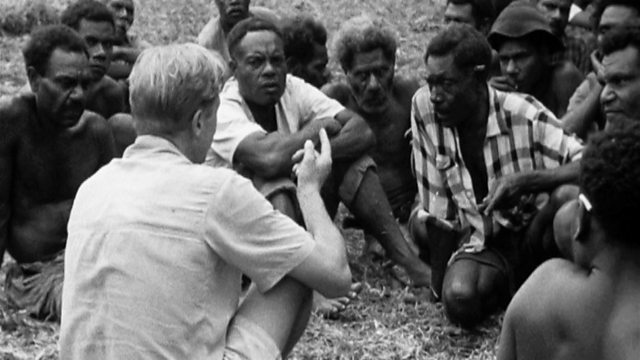 In Tanna, David interviews members of the John Frum cargo cult. The group's members take an unusual interest in radio signalling equipment, and they build intricate scarlet gates and crosses throughout the island and across the hazardous volcanic plains. This programme is part of a BBC Four Collection showcasing the early work of Sir David Attenborough. A collection of programmes showcasing the early work of Sir David Attenborough. Working with the legendary broadcaster on our BBC Four archive collection.